The mayflies of this family are known mostly for their curious shapes, but they can create excellent spinner falls, too. 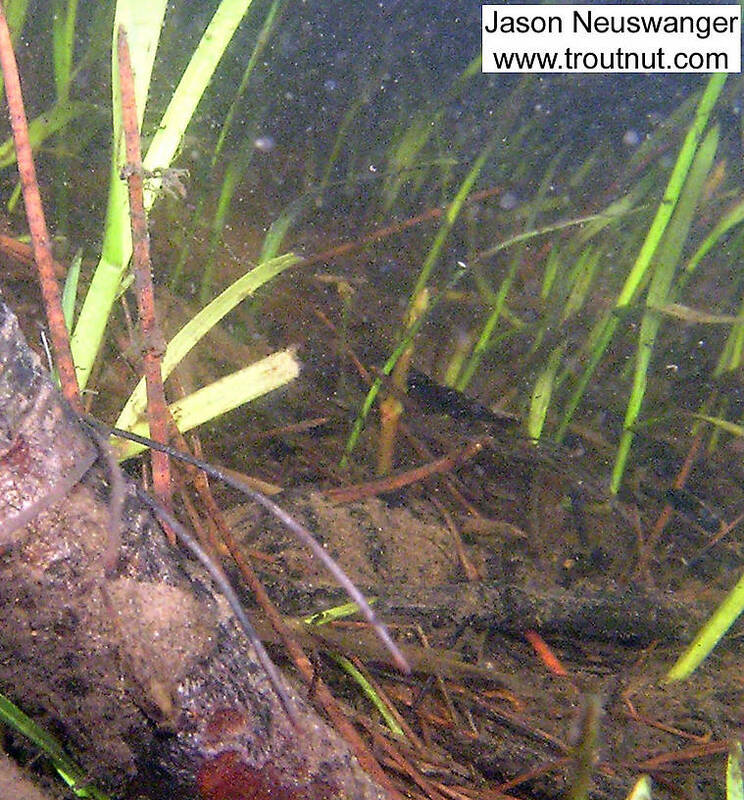 Read about Baetisca, the only genus in this family, for details. There's a very well-camouflaged Baetisca laurentina mayfly nymph resting on the twig in the bottom left corner of this picture. Can you spot him? 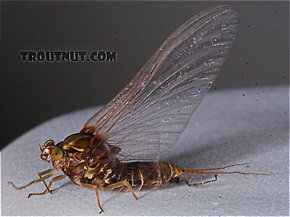 In this picture: Mayfly Species Baetisca laurentina (Armored Mayfly). Based on reports from several sources and my own experiences, I'm beginning to think it is significantly more important than it has been credited for. The duns emerge by crawling out onto land, so they aren't important, but some of my most memorable fishing nights of 2005 were due to Baetisca spinner falls. It is a tricky hatch to detect. I haven't seen more than a couple of their spinners in the air at a time, though some of my friends report spotting their swarms. Normally for me they just showed up on the water from unseen swarms upstream. They were mixed with spinners from Ephemerella invaria and Maccaffertium vicarium, among others, but the fish were relentlessly selective to the Baetisca laurentina spinners. I wasted the better part of an hour flinging a sulphur imitation the first time I encountered a Baetisca fall. Like Ephemerella spinners, they can be hard to spot on the water, and they were much more sparse. I finally captured one, noticed the very different body profile, and since I didn't have anything remotely imitating it I continued to catch no fish. I returned the next night with an imitation with a robust, opaque body, and the fish went crazy for it. I just finished reading through the account by Caucci and Nastasi in Hatches II about how the extremely important Ephemerella invaria sulphur species went unnoticed for decades because it was confused with Ephemerella dorothea. The maddening difficulty of some dorothea hatches was partially explained away once people understood this difference. Although Baetisca is much less prominent than Ephemerella invaria, I suspect it has similarly been confused with well-known sulphur species in the rare locations and occasions where it is important. Hi there; I just gathered a sample from our local Black River here in SE Vermont, and found a thriving population of armored mayflies. Wasn't sure what they were at first, with their bubble-humped backs and short little tails, but once I used my hand lens I realized they have tiny little "thorns" behind their last legs. Their mottled coloring resembles everything I've seen here, confirming my ID. I'll be sending off a sample to a friendly bug lab to let the pros look at them. are these flies the flies we call batflies? They look like a size 12 may fly on the water but have a very stubby abreviated and robust body. They are becoming more and more a factor where I fish on the Au Sable River. Do these spinners retract thier tail section into the thorax? 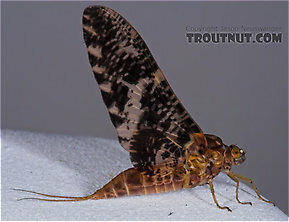 I was fishing the Vermillion River in Minnesota south of the metro area and found a nymph similar to the Armored Mayfly Nymph. It did appear to be much more green in color. It was moving through a really muddy part of the stream, which I found interesting. It sounds like the Baetisca hatch is really going on here in northern Wisconsin now. I've heard reports from more than one source about fishable Baetisca laurentina hatches on two of my favorite rivers. I bought some imitations and hopefully I'll be using them tomorrow!